Red Desert (Il Deserto Rosso, 1964) was writer-director Michelangelo Antonioni’s first film in color and came directly after his celebrated trilogy of alienation, L’Avventura (The Adventure, 1960), La Notte (The Night, 1961), and L’Eclisse (Eclipse, 1962). 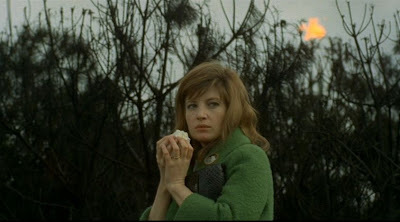 Although the color cinematography marked a new direction in Antonioni’s visual aesthetics, the film’s thematic issues represented a continuation, and even a culmination, of those covered in the preceding trilogy. As I already remarked in connection with the preceding three films, the underlying themes in those films projected a progressive pessimism concerning the possibilities of authentic human love. L’Avventura examined the ephemerality of love; La Notte resigned itself to the inevitable breakdown of the long-term (marital) romantic narrative; while L’Eclisse pondered the modern-day difficulties of even starting an authentic loving relationship. Red Desert digs even deeper still into these issues by presenting a protagonist who feels cut off from authentic connection with everything in the world. Admittedly, this protagonist is psychologically disturbed, but her character is eerily comprehensible and metaphorically represents a psychological malaise that underlies our modernist culture. These issues are explored in more detail in my essay, “Phenomenology and Red Desert” . The narrative flow in most of Antonioni’s films is somewhat problematical, because clear-cut goals or targets are hard to identify, and when they do appear, they are are sometimes misleading. Often the story moves in a circle, with the protagonist’s desires remaining unfulfilled and frustrations unresolved. But at the same time there has been inner journey undertaken, and by the end of the film, the protagonist has often arrived at a new understanding of the compromised world in which he or she (usually it’s a woman) must live. So it is with Red Desert. Despite all these pessimistic observations and equivocations, let there be no mistake: Red Desert is an outstanding film, perhaps Antonioni’s best. 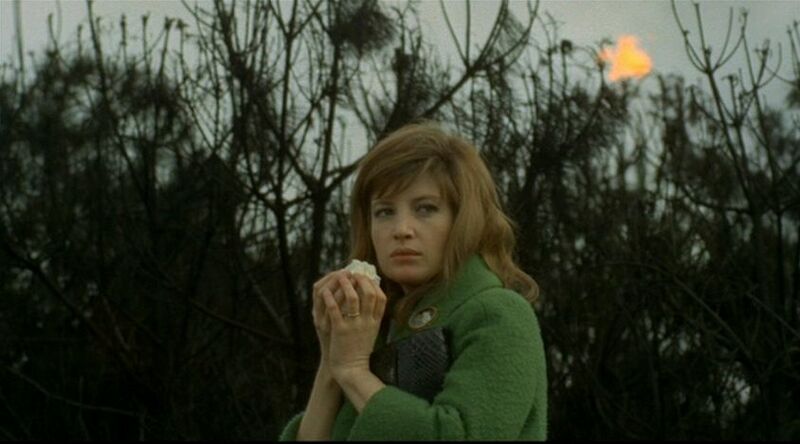 Antonioni has explored new visual techniques here for the revelation of the inner moods and feelings of psychological narrati ve. Much of what is conveyed is not only not presented in verbal terms, but almost outside the scope of verbal expression. 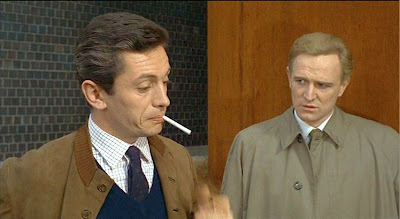 Antonioni achieves this expression not only by his use of color, but also by his comprehensive use of composition, editing, character movements, and camera techniques. The plot (i.e. the syuzhet) of Red Desert is all about the main character, Giuliana, and passes through five stages as it follows her struggles to come to grips with her disturbed psychological condition. Her problem is that she feels isolated, cut off, from everything in the world – she feels an acute sense of separation that makes her feel disoriented and desperate for engagement. Though each of the narrative stages of “acts” may offer Giuliana some temporary relief, they conclude with a return to isolation and greater despair. The opening section shows Giuliana (Monica Vitti) escorting her young son of about five years of age, Valerio, on foot towards the petrochemical plant that is managed by her husband, Ugo. Immediately the viewer sees that there is something wrong with Giuliana, as she nervously and impulsively purchases a half-eaten sandwich from one of the workers eating lunch outside the plant. Throughout this section the viewer is presented with unexplained shots of (to us) bizarre industrial structures and debris. It all looks grotesque and inhuman to the ordinary viewer – a representation of brute, inexplicable processes that seemingly are outside the scope of normal human activity. We are then introduced to the plant manager, Ugo (Carlo Chionetti), who is conversing with a visitor, Corrado (Richard Harris), who seeks to recruit some workers for some sort of industrial operation in far-way Patagonia, Argentina. Both Ugo and Corrado are comfortable in the noisy surroundings of the factory – they are modernists, at home in the engineered world of Western civilization. In their conversation Ugo tells Corrado that his wife, Giuliana, had a recent auto accident, and though she was physically unhurt, she has not been right mentally since then. Later, at home in their apartment, Giuliana is seen to be highly agitated and fearful, and Ugo is unable to soothe her. They then go to a radar installation facility, where a worker Corrado wants to recruit is located, and again the industrial architecture provides something of a metaphor for Giuliana’s alienated state. This section and the cinematography employed by Antonioni to convey these effects is further discussed in more detail in the article, "The Visit to the Radar Installation in Red Desert” . 4. Giuliana More Isolated (25 minutes). After Ugo leaves on a five-day business trip, Giuliana spends more time with Corrado and reveals more about her inner anxieties. When she returns home, she is alarmed to discover that her son has apparently become suddenly paralyzed from the waist down. Giuliana feels powerless, but tries to soothe him with a story that she invents. It is about a young girl who lives on an island and swims off a beach at an isolated cove. The girl is perfectly at home with her surroundings, but after a silent approach by a mysterious offshore sailing ship, all the rocks of the cove seem to come alive and sing to her in one voice. Shortly after her story, Giuliana discovers to her shock that Valerio was only pretending to be paralyzed; and her inability to imagine why he would torture her with such a stunt brings back her sense of loneliness and isolation with a vengeance. Getting desperate to end her isolation, Giuliana rushes to Corrado’s apartment. Corrado succumbs to his masculine instincts and tries to force his affections on her, which the exhausted Giuliana initially tries to resist. Eventually Corrado makes love to her, but it doesn’t help. They part the next day, and the distraught Giuliana wanders to a dockside ship and self-reflectively airs her troubles to a foreign sailor, who can’t understand a word she says. “We are all separate,” she complains; “if you prick me, you don’t suffer.” She seems to be completely alone and at her lowest state. But in the next, and final, scene, perhaps some time has passed. She is again walking with Valerio near her husband’s plant. 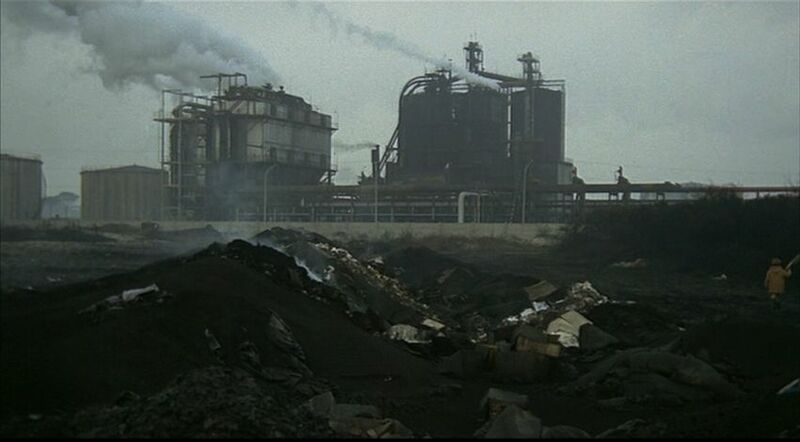 When Valerio spies a smokestack emitting poisonous smoke, he wonders if the birds who fly near it will sicken and die. Giuliana advises him that the birds learn not to fly over there. These words indicate that her psychological depression and sense of isolation has not been cured, but she is learning how guide her mind away from those thoughts. She is trying to to cope and live in this world as best she can. In this film Giuliana authentically faces the full horror of existential doubt, and our modernist culture offers her no solace or comfort to alleviate her anguish. Corrado is half-way to understanding her situation. Even though he is a man of action, an engineer who is comfortable in the modernist scheme, he feels some sympathy towards her and shares the feeling of being lost and that there is something missing in his life. But he doesn’t fully understand the depth of her anxiety, and his amatory advances are not what she needs. 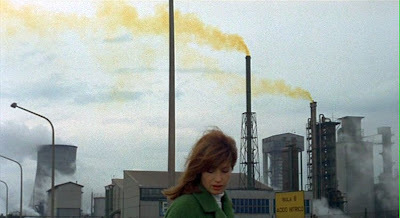 Throughout Red Desert Antonioni uses cinematic techniques to align the “silent witness” (the viewer) with the way Giuliana engages the world. This is accomplished in various ways. For example whenever Giuliana is shown in a mentally distressed state, she is isolated from others by being the only person in the frame. This subjective isolation extends to her surroundings by having her photographed with a telephoto lens having a relatively short depth-of-field, which leaves only her in focus and everything else in a blurred, difficult-to-recognize state. Even in these situations, though, whenever the frame does include other people, the depth-of-field is greater, with much of the field in focus – hence the scene is presented as more “objective”. In the blurred world of isolation, one is frighteningly powerless; whereas in the more in-focus, objective, world, a person can take action and is more comfortable. In other words, when Giuliana is distressed, she is powerless, and her “world” has less affordance. This affordan ce contrast is accentuated with respect to Corrado, who is often shot with a wide-angle lens, which suggests that he is inhabiting a “world” that particularly affords wide movement and action. These contrasts of isolation and affordance are particularly evident in the brief scene in which Giuliana and Corrado visit the radar installation . A further visual evocation of psychological state is accomplished in connection with the camera angles and editing. In the scenes in which Corrado and Giuliana are together, there are often jarring edits, where the camera angle is only slightly changed between two shots. This has a somewhat disorienting effect on the viewer and is ordinarily avoided by professional filmmakers, but here the cuts contribute to the feeling of Giuliana’s agitated state. By contrast in the dockside shack scene, where the confined multi-person camera setups would have been more difficult, the editing is more fluid, which accords with Giuliana’s more comfortable state, where she is surrounded by friends. In fact the two sequences in the film that have a more conventional cinematic look to them – the shack scene and Giuliana’s story of the girl in the cove – are the two sections that present Giuliana in a more “normal” (i.e. comfortable) state. In the shack scene she is comfortable, because her wished-for “wall of friends” distract and protect her from the brute reality of the world outside. In Giuliana’s story (about the girl in the cove) scene, she is describing an imagined ideal world where she can be one with all of reality. Note that in general the worlds that Antonioni’s men and women live in have characteristic differences. The men live in worlds in which they construct their own narratives (or perhaps we could say that they play their own self-constructed games). 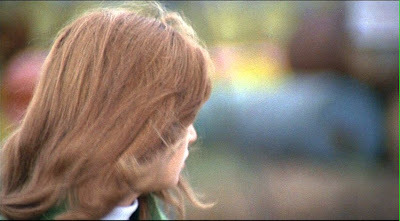 On the other hand Antonioni’s women are more passive and tend to be seeking a given, stable world (not a self-constructed one) – a world in which they can have stable relationships. This is reflected in Red Desert in the “shack” episode in Act 3, where the other two women in the p arty seem to be somewhat passive pawns of the game-playing undertaken by the men . Moreover, Giuliana’s story about the girl in the cove also presents a fantasized and now unattainable stable world. Overall, Red Desert offers Antonioni’s most disturbing vision of the psychological inadequacies, and ultimately the impasse, that our Western modernist culture has left us in. It reveals a cultural neurosis that we still haven’t come to terms with, but to which other existentialist and Sufi artists have also pointed. 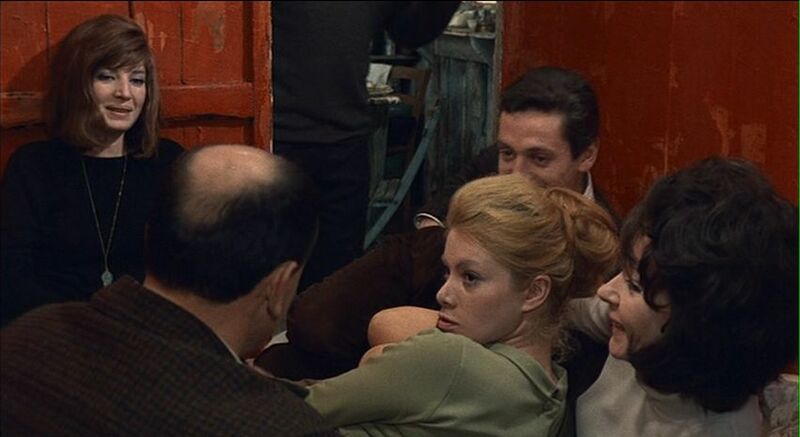 Antonioni seems to have worked intuitively, rather than from a logical or analytical framework, and this is what makes the film original and profound. When we, the viewers, watch the film, we share and participate in the direct psychological vision of the artist – all unmediated by the mechanical artifices of the written word. This is the essence of artistic co-creation, and Antonioni’s achieved it in Red Desert by exploring new forms cinematic expression. Phenomenology and Red Desert, The Film Sufi, 2010. "The Visit to the Radar Installation in Red Desert", The Film Sufi, 2010. This is even taken to the point of their accepting the men’s versions of reality. When one of the women in the “shack” scene says she heard a cry from outside of the shack (also heard by Giuliana), the men insist that she couldn’t have heard such a cry. To the consternation of Giuliana, this woman then acquiesces to the mens’ story and concedes that she didn’t hear anything.